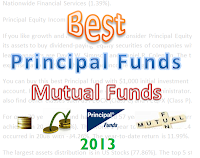 Find best Principal mutual funds 2013. Check top stock, bond, balanced fund by Principal Funds. Discover the best Principal fund’s performance and review. The top funds are Principal Global Diversified Income fund. Principal Financial Group (PFG) is a global financial services company. It provides a wide range of financial services including retirement solutions, insurance, investment, planning center, financial, and banking products. It offers mutual funds, annuities, saving accounts, and certificates of deposit (CDs) in its investment business. The mutual funds are offered from its Principal Funds arm. These best Principal mutual funds 2013 are selected based on its performance history and future performance. These top mutual funds are ranked with 3 star rating or higher by Morningstar. You may find the fund review below and other fund information. For individual investors, you can select A, B & C shares from brokerage firms or financial professionals. For retirement plan investors (401k or Roth or traditional IRA), you may be able to purchase the mutual funds from your retirement plan using J shares, R1 Shares, R2 Shares, R3 Shares, R4 Shares, R5 Shares, Institutional shares, P Shares. Principal Global Diversified Income fund objective is to provide cash income through a diversified, yield-focused investment strategy. This best Principal fund utilizes its assets to purchase high yield bonds, preferred securities, commercial mortgage-backed securities, emerging market debt securities, and stocks (REIT, MLP). The current portfolio managers are Kelly Grossman, Michael P. Finnegan and Dave Reichart. This Principal fund has large assets of $8.0 billion. The annual expense ratio is 1.13%. As the best conservative allocation mutual fund, you will receive a high yield dividend of 5.01%. The other classes are Class C (PGDCX) and Class P (PGDPX). As of the first quarter fund fact sheet, it has 1374 of total holdings. The top 5 holdings are Enterprise Products Partners LP (0.67%), Verizon Communications Inc (0.56%), Plains All American Pipeline LP (0.55%), Magellan Midstream Partners LP (0.54%), Williams Companies Inc (0.52%), etc. The top 3 sectors breakdown is Sensitive (46.35%), Defensive (27.64%) and Cyclical (26.0%). Principal High Yield fund is another best Principal bond mutual fund. It uses its assets to buy a portfolio of high yield bonds or junk bonds. This lower quality bonds provide high yield income for investors. The high yield currently stood at 6.71%. Mark P. Denkinger and Darrin E. Smith are the fund’s managers. Its expense ratio is 0.91% per year. The minimum initial investment is $1,000 for either brokerage or retirement account (Roth IRA or traditional IRA). You may invest in your 401k account to take advantage the high yield for future retirement. This bond fund has its best 1-year total return in 2009 with 41.90%. The 5-year average return is 9.36%. The fund has 4.88% year-to-date return as of May 1, 2013. Based on the load adjusted returns, it has returned 9.52% over the past 3-year and 10.25% over the past 10-year. The effective duration is 3.58 years and the effective maturity is 7.04 years. The fund has a total of 302 holdings as of February 2013. The top holdings are Seagate Hdd Cayman (1.84%), Dish Dbs (1.16%), Entpr Prods Oper FRN (1.07%), Taminco Global Chem (1.06%) and Multiplan (1.05%). This Principal Preferred Securities fund is one of the best Principal mutual funds in the Intermediate-Term Bond category. It invests mainly in preferred securities in the U.S. and non-U.S. financial services (banking, insurance and commercial finance). It may invest in real estate investment trust (REIT) and utility industries. It has an annual expense ratio of 1.06%. As one of the popular mutual fund, it has $5.5 billion of total net assets. The dividend yield is 5.21% per year. This fixed income mutual fund is ranked with 4-stars rating by Morningstar. It has 5 years of positive returns and 2 years of negative returns. The best performance was occurred in 2009 with 46.15%. Based on the load adjusted returns, the fund has returned 9.81% over the past 3-year. As of May 1, 2013, its year-to-date return is 4.25%. The 3-year beta risk is -0.02. As of February 2013, the top 10 holdings represent 15.39% of the total 342 holdings. They are Prudential Financial (2.60%), Qbe Cap Funding Iii (1.71%), Zfs Fin Usa Tr Ii (1.70%), Catlin Ins Co (1.54%) and Nationwide Financial Services (1.39%). 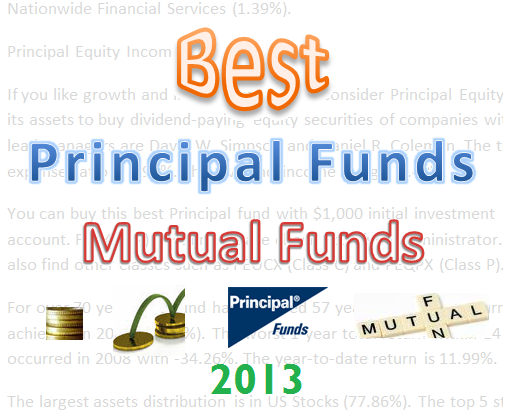 Principal MidCap fund is one of the best Principal mutual funds 2013. It invests mainly in equity securities of companies with medium market capitalizations. It has $5.4 billion of total net assets. The expense ratio is only 1.08%. This fee includes a 12b1 fee of 0.25%. This mid cap growth mutual fund has annual holdings turnover of 21.10% as of April 29, 2013. The yield is 0.78%. It is currently under the management of K. William Nolin and Thomas Rozycki. Ranked with 5-stars and Silver rating by Morningstar, this stock fund has YTD return of 13.27%. As one of the top Principal funds, it is currently in the 9th rank in the category (as of May 1, 2013). This equity fund has recorded 6 years of positive return with the best in 2009 with 32.50%. The only year it has returned negatively so far was in 2008 with -34.09%. The 3-year beta risk is 0.83. As of March 2013, the top 5 stocks in its portfolio are Liberty Media Corporation (3.24%), O’Reilly Automotive Inc (3.12%), Brookfield Asset Management Inc Class A (3.04%), Loews Corporation (2.48%) and William Companies Inc (2.43%). The top 10 holdings of this PEMGX fund represent 25.40% of the total net assets. If you like growth and income, you should consider Principal Equity Income fund. This PQIAX fund uses its assets to buy dividend-paying equity securities of companies with large market capitalizations. The lead managers are David W. Simpson and Daniel R. Coleman. The total net assets are $4.9 billion. Its expense ratio is 0.96%. The dividend income is high, 2.40%. You can buy this best Principal fund with $1,000 initial investment for your brokerage and retirement account. For 401(k) account, please check your fund administrator. Other than this class A fund, you can also find other classes such as PEUCX (Class C) and PEQPX (Class P). For over 70 years, the fund has achieved 57 years of positive returns. Its best 1 year total return was achieved in 2003 (29.22%). The worst 1-year total return within 14 years of negative return was occurred in 2008 with -34.26%. The year-to-date return is 11.99%. The largest assets distribution is in US Stocks (77.86%). The top 5 stocks in its portfolio are Mattel Inc (2.19%), Digital Realty Trust Inc (2.10%), ACE Ltd (2.08%), JP Morgan Chase & Co (2.05%) and Pfizer Inc (1.95%). If you like a global real estate sector, you should consider Principal Global Real Estate Securities fund. It invests in equity securities of small, medium, and large market capitalization companies of real estate companies. The fund is ranked with 4-stars rating by Morningstar. It has $1.4 billion of total net assets. The annual expense ratio is 1.45%. Based on the load adjusted returns, this best Principal fund has returned 14.69% over the past 1-year and 2.97% over the past 5-year. You can buy this fund from brokerage such as BlackRock, Alliance Bernstein, T. Rowe Price, Goldman Sachs Asset Management, Principal Management Corporation, etc.